My final project brief of my first semester was ‘On ice’. What is the allure in seeing human endeavour on ice; the performance of extreme expeditions, discovery and survival? What prompts the fear and fascination we still have with ice ages, the splendour of a winter wonderland, or frost fair? The white expanse of the Arctic and Antarctic have entered our imaginations, while the magnetic pull of the North and the South Poles affects the compass of our dreams, our sensibilities, our art making, our stories and songs. Ice is captivating; it’s strong, yet fundamentally fragile; monumental, yet essentially impermanent. Ice freezes time (encapsulates it for thousands of years) and ice, like fire, transforms life. I began brain storming a range of ideas from drinks on ice, images frozen in ice and eventually narrowed it down to global warming. The brief claims ‘ice, like fire, transforms life.’ and as I done more research I found out that CO2 emissions from power plants were the main cause – it pieced the idea of ice and fire together. I researched random global warming art and images to get a feel for what I was going to explore and as I did this the images above gave a certain visual impact that intrigued me. From this I combined them into my own work by using the ice cream cone idea in acrylic which then transferred my mind to the idea of the burning world and I began to think about sculpture and 3D work for this project. As I went home the idea continued to spiral of the world melting. I decided to experiment a little by freezing a block carving it and then watching it melt. After reading the book Representing, performing and mitigating Climate change in contemporary art practice, Gabrilla Giannachi, 2012 Ackroyd & Harvey and their sculpture Ice lens (2005) inspired my experimentation due to their visual response to climate change. I carved the block of ice that had been left to freeze for most of the day into a sphere and painted quickly onto it with blue and green acrylic paint. I then video the paint dripping off and the sphere melting away until there was nothing left. I wanted the message to be that if global warming continues there won’t be anything left and we need to make changes to the world we live in. Although the video was not a success I did manage to get a few still shots that I thought were interesting and made my idea come across well. As my creative thinking process began to expand more I decided to research artists and contributions to global warming, which is when I found out that when deforestation happens and is used for fuels in power plants it is one of the major contributions because trees remove and store carbon dioxide. When I heard of this I came up in my head of a piece of 2D work that included power plants and trees but that you could remove the power plants to reveal the trees which continued into the smoke of the power plants. This was supposed to trigger a visual impact that portrays that people are cutting down forests to provide fuel etc and we are burning away the world as we know it. However I did not show the trees completely burning so that it can demonstrate a reverse effect that we can stop this and it’s not too late. In the background are arctic mountains to convey the literal melting away and the damage that can and is being caused. As my idea had the image of moving the power plants away I decided to think about slide tab such as the ones you would find in children’s books. Due to this I thought it was appropriate to look at illustrations and paintings that looked childlike in nature. This is when I came across Linda Dawn Lang who created paintings that were smooth with subtle colours and based on global warming; in particular arctic mountains. I established her painting style into my own work and could see my work evolving. At the same time I observed artists such as Henri Rosseau who was a primitive painter and his use of colour, shape and form had intrigued me as it appeared quite illustrative and that is what I wanted to achieve. I created an oil painting of a power plant with his illustrative style painting inside and think that it was successful. Afterwards Thomas Hart Benton’s work ‘Trail Riders 1984-65’ had enticed me with its general composition and waved form that I later used in my skies during my final experimentations. Pictured above is my final idea coming together with a different painting style for the mountains. 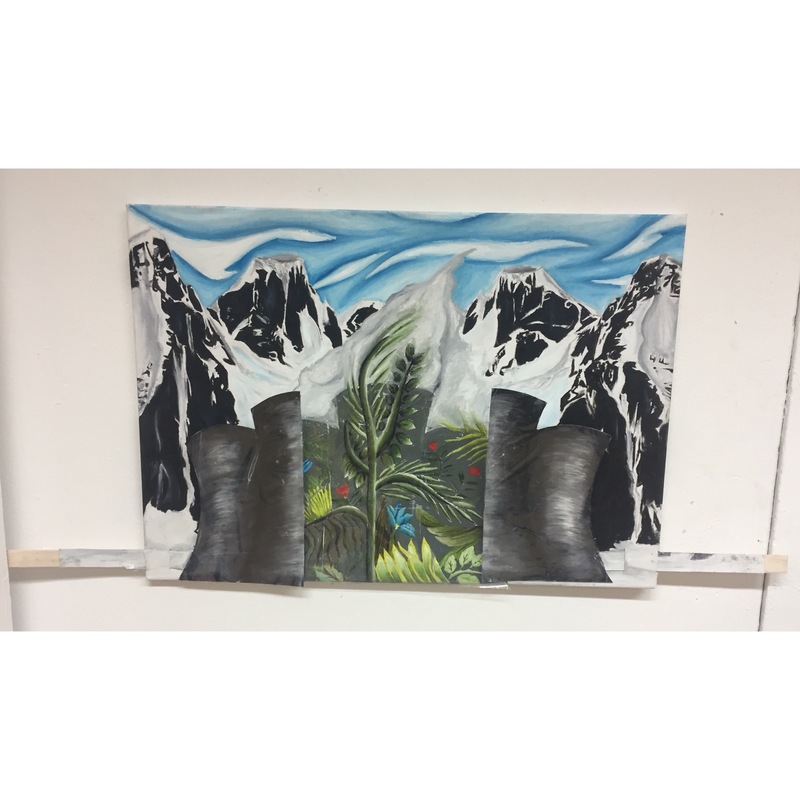 My final outcome for ‘On ice’ consisted of me reinterpreting the art of Henri Rosseau inside power plants which then split down the middle and slid out to reveal what lies under. The visual message is once closed you can only seen some green leaves burning on top of the power plant but it becomes more clear once opened that it is deforestation. The arctic mountains I kept as a more realistic and detailed approach as I felt it was the best option after experimenting with other techniques. Lastly the sky was inspired by Thomas Hart Benton as I feel it gives an aesthetically pleasing appearance. Overall I feel my idea progressed and worked well on a larger scale (A1 canvas) with oil paint as my chosen medium.